I am not much of the lime pie fan but this one is sweet enough for me. I don't like to pucker when I am eating pie. Know what I mean??? It has been getting warm and humid on Beaty's Creek and this pie hit the spot. This is What's Cookin on Beaty's Creek. Don't email me, I know this is "NOT" cookin but at least I do it in the kitchen. 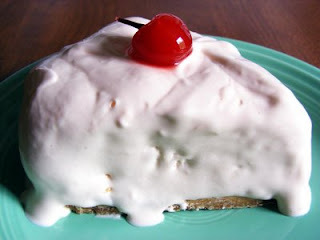 Mix together sweetened condensed milk, limeade, cherry juice, and Cool Whip, when thoroughly mixed pour into your graham cracker crust. I made my crust from scratch but you can use a store bought one too. Now place pie covered in freezer over night. Serve with a cherry on top. This will make you think of your favorite cherry limeade drink. Ah a fellow OK blogger. The pie looks great. Thanks! Yes, we were just in Tulsa yesterday.